Tis the season to put pumpkin in just about everything. The great thing is, pumpkin is low calorie, high in fiber and high in beta carotene! So, rock on with the pumpkin craze. 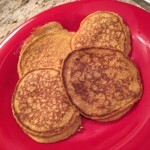 I've been making these pumpkin pancakes for YEARS and just had to share the recipe now that I have a forum to do so in! Heat a pan to medium with fat free nonstick cooking spray. Put all the ingredients in a blender. I use a little single serving Oster blender but any blender or food processor will work. The batter will be more thin than normal pancake patter. 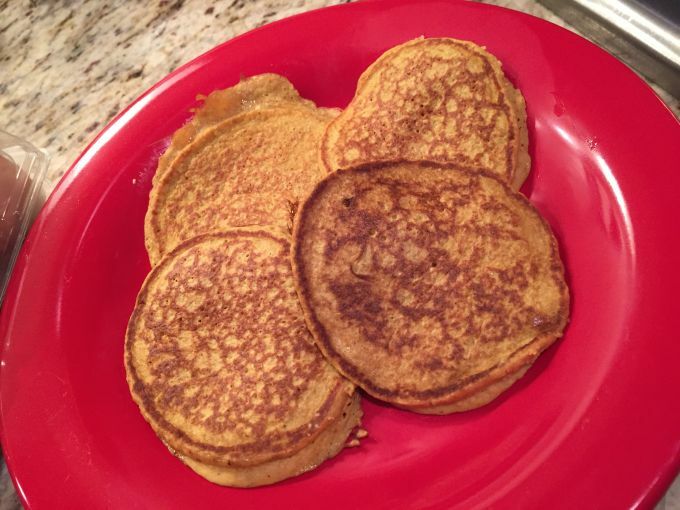 Pour batter onto the pan about 4 tbs at a time to make small pancakes. Flip when the bubble a bit. Be careful not to overcook. The cook quickly since the batter is so thin. Serve immediately! I top them with sugar free syrup and a couple sprays of butter spray. Applesauce makes a great topping too! This makes a single serving but it works just the same if you double or quadruple it for other people! It is a really nice, light, Thanksgiving morning meal!